A lifelong national parks buff finds plenty of natural assets to appreciate right here at home in New Mexico. National Monument. Right: White Sands. WHEN I WAS A KID, my family squeezed every penny. This bought all three kids college educations, but cost us summer vacations, which rarely ventured farther than man-made lakes close to our Kansas home. In third grade, Miss Parsons made us design a family trip. She wanted us to learn how to read maps, figure mileage, and devise a budget. Given the dream of going anywhere I wanted, I set my inner wanderer free and went, well, everywhere. My imaginary itinerary wound past Mount Rushmore, Yellowstone, the Grand Tetons, Yosemite, Sequoia, the Grand Canyon, and Carlsbad Caverns. In nine days. By car. I came nowhere near an A on that little assignment, but what I learned was huge: National parks are actually within driving distance, and they are cool. America was the first nation to protect a huge and gorgeous place as a national park—Yellowstone, in 1872. As more lands joined the portfolio, the need for management grew. Hence the 1916 creation of the National Park Service, and its centennial celebration this year. 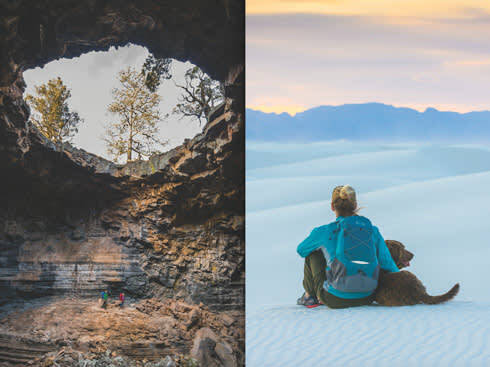 There’s reason to root for the home parks: In 2015, more than 1.7 million people visited New Mexico’s 15 national parks, toting up an economic impact of nearly $119 million in jobs, lodging, food, and souvenir T-shirts. I’ve done my part. In fact, as an adult, I’ve visited national parks from Maine to Alaska—so many that I’ve come to covet one of those official “lemon-squeezer” ranger hats. But I’m a mere piker among people who love the parks. The National Parks Travelers Club claims 1,300 dues-paying members dedicated to popping into every one of the nation’s 411 or so protected areas (the number keeps growing). Other fans focus on the 59 sites that have “national park” in their name, as opposed to all the national historic sites, national monuments, and national trails and seashores that NPS also oversees. All that loyal visitation is nothing compared with what it takes to keep the parks running. Chronically underfunded and too often grappling with forest fires, graffiti vandals, and the kinds of grumps who can find fault with a sunset, park rangers and managers are the unsung heroes of the outdoors. Besides knowing how to work admissions, handle crowds, and deliver life-saving care, they protect archaeological sites, preserve historic buildings, conduct research, and know more about the history and science of their parks than almost anyone. They even give free chats on bats and birds, along with tips on which trails to take and which stars form Orion. For all this, the entrance fee to a New Mexico park can be anywhere from free to still-less-than-an-evening-at-a-cineplex. During a road trip last summer, I pulled off I-25 and drove eight miles to Fort Union National Monument, where admission is always free. Sunflowers complemented ruddy adobe walls for picture-taking perfection. I wandered the trails, read about the people who once lived here, imagined it bustling with soldiers and Santa Fe Trail riders, and worked up the nerve to tell a ranger that I didn’t know what a dragoon was. (Another word for “soldier,” he said.) We ended up in a long, friendly chat about his and other New Mexico parks, whereupon I realized that I was just one shy of hitting them all. Then and there I gave myself a mandate. Not to finish the list (I notched the last park, Capulin, just days later). Now, my plan was to hit all of them … again. I doubt I’ll polish them off this year, despite all the centennial hubbub. But I’ll plan something significantly commemorative when all the parks celebrate their collective birthday on August 25. The problem will be deciding among forests, deserts, and caves, as well as ancient pueblos, Spanish churches, and Civil War sites. Over the years I’ve enjoyed countless visits to Bandelier National Monument; taken UNM continuing-education trips to Chaco Culture National Historical Park and Salinas Pueblo Missions National Monument; hiked with renowned geologist Kirt Kempter in the Valles Caldera National Preserve; scrambled around Petroglyph National Monument; marveled at the Doll’s Theater in Carlsbad Caverns National Park; and slept under a full moon at White Sands National Monument. The hike around the rim at Capulin Volcano National Monument was nice, but what made me a little giddy was the riot of wildflowers on a trail below—bee balm, lupines, and mariposa lilies. No other visitors ventured out there with me that day. It was as though I’d opened a secret hatch and walked into another world. National parks are like that—places where a community comes together and individuals find themselves. Onward I go to revisit the grand 15. But wait. In New Mexico, NPS also claims 1,121 listings on the National Register of Historic Places, plus 46 national historic landmarks, 12 national natural landmarks, and three national historic trails. Seems like that’s enough to deserve a visit-every-one club just for New Mexico. Imagine how dreamy all our lives would be as we worked through that fine list of our here-at-home wonders. Kate Nelson is the managing editor of New Mexico Magazine.